"Equinox has served Rocky Mountain Health Plans for over a decade. 'The Equinox Approach' is not a cliche, it is a way of doing business which has provided us with valuable, measurable outcomes. Virginia ("G") Winter is an organization development practitioner and master-level facilitator. She is Managing Principal of Equinox Consultancy LLC, a woman-owned, management consulting business in operation since 1989 serving private industry, non-profit (NGO) and public sector clients. Core competencies include: strategic planning, organizational learning, environmental sustainability strategy, corporate responsibility, governance, management systems, external reporting and internal communications, stakeholder engagement, change leadership and innovation. Equinox has served a diversity of clients: Fortune 100/500 Food & Beverage, and manufacturing companies, high-tech firms, health care corporations, world-class resorts and hotels, universities, foundations, trade associations, federal, state and municipal agencies, community coalitions and individual leaders. Ms. Winter has extensive experience moderating strategic dialogue with senior-level leaders and decision-makers and is skilled at facilitating conversations to engage thought diversity and cross- functional expertise. Ms. Winter has a reputation as a skilled change agent regardless of whether the assignment involves long-range cultural change or short-run group development. She is frequently asked to custom design work agendas that foster meaningful engagement, collaborative decision-making and action planning for shared accountability. Recent engagements include - coaching senior managers on the organizational change aspects of CR governance & the launch of steering committees; integrating CR strategy with existing business goals, and EHS management systems; facilitating cross-functional groups as they develop sustainability goals & metrics (employee engagement, supply chain, water, waste and energy/carbon tracking); facilitating work teams analyzing CSR risk & opportunities, assessing and mapping stake-holders and creating a real-time sustainability vision, strategy and 'roadmap.' Ms. Winter consistently incorporates organizational learning (system thinking) tools in the design and facilitation of group work approaches to corporate responsibility and environmental stewardship. Ms. Winter created the "Environmental Leaders Dialogue" a peer-leadership forum that has been used by The EHS Auditing Roundtable. She is published in the Journal of Corporate Sustainability (2001) and been a conference plenary speaker at the Greening of Industry (2003), Environmental Engineering in the Food and Beverage Industry (2004) and EnvironDesign6 (2002.) Virginia worked as Senior Consultant for Delta-Oranjewoud's Global Corporate Consultancy during 2008-2009. Ms. Winter received a B.A. degree from Wells College majoring in Environmental Policy, Science and Value. Originally from the Adirondack Mountains of New York, Ms. Winter resides in Colorado. 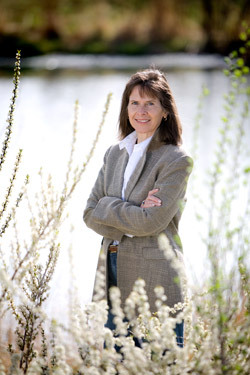 She has served on the Board of the Colorado Council of Mediators & Mediation Organizations, the Middle Park Land Trust and the Sustainable Futures Society.